Songkran in Pattaya is unlike anywhere else in Thailand. The famous water festival is taken to extremes and the whole city becomes not so much one giant water fight as a week-long pitched battle! The gentle origins of this traditional celebration are mostly lost amongst the buckets of ice water, high-pressure soakers and foam parties on Beach Road. While the Songkran holiday only officially lasts for three days (13. – 15. April), Pattaya’s party atmosphere means that you are likely to get a thorough soaking as much as a week beforehand and several days after. Some of the city’s expatriates, who have had their best office togs doused in freezing cold water once too often, choose to take the week off and escape to Koh Samet or other nearby havens while many others stock up on supplies and barricade themselves indoors. However, much more stick around for the best all-day wet and wild party in Thailand. If you like fun and hijinks, there is no better place to be in mid-April. Songkran is the Buddhist New Year festival and is generally associated with a spring clean at home and preparing for the coming year. It is a time to venerate the elderly and spend time with the family. Thais traditionally lightly sprinkle or gently pour warm water on relatives, close friends and neighbours to wash away the bad luck of the previous 12 months, giving a fresh start for the future. Songkran in Pattaya, however, is rather different. The above activities will take place in traditional households and the temples around the city will be packed with devout Buddhists making merit, but the streets will gradually develop, over the week, from infrequent ambush points (usually around bars) to a full-blow water war…but always light-hearted and fun. Songkran officially lasts three days, but City Hall commonly extends it in Pattaya so that it lasts a full week, with the last day being the craziest day. This additional holiday is called “Wan Lai”, which means “day that flows”, but is generally lumped together with and commonly referred to as Songkran. 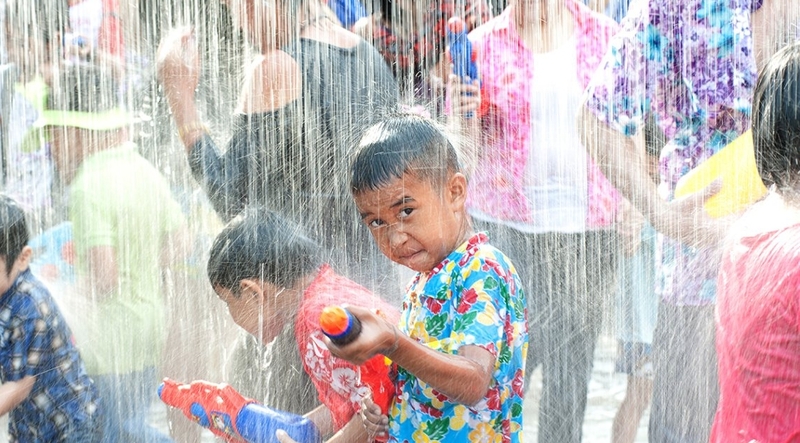 Although Wan Lai is only one day – the last day – most people link it to the earlier holidays, creating an extra few unofficial days of Songkran. On Wan Lai Day, the water really does flow – practically continuously. Everybody is armed with a water dispenser of some description. Some favor the semi-traditional bucket, many go for a water gun and some use Heath Robinson high-pressure hoses made from a length of plastic plumbing pipe with a small hole at one and a plunger at the other. These are easily available but are considered too powerful and the police will confiscate them if they see you using them. An additional weapon you are likely to encounter during Songkran in Pattaya is the mysterious white paste. This mix of talcum powder and water is commonly applied to the face (but this is Pattaya and it is the weapon of choice for most bar staff, so expect to end up with white handprints all over). This has no cultural significance whatsoever and is done purely for fun, though it is considerably less fun when it gets into your eyes! Every bar will have a selection of water butts in front, generally with a few large blocks of ice floating in them. Most will ask that you buy at least one drink if you are going to reload your gun there, though you can find some butts free for public use if you look around long enough. Naturally, this means that every bar becomes a nest of water shooters and you are liable to be ambushed and completely drenched as you walk past. With roads where every building is a bar – particularly Sois 6 and 7 – this creates complete bedlam and a constant unavoidable crossfire. Beach Road is cut off to traffic and stages are set up for live music and foam machines. The fire department park their engines here, filling numerous water butts for revellers to reload their soakers from. On the roads that do allow vehicles, the main ones become a slow-moving traffic jam. Pick-up trucks are turned into mobile parties, with their own water butts, the radio on full volume and many young Thais strafing pedestrians and other vehicles from the back. Some of the more bizarre sights to see include monks sat in the back of pick-up trucks, rolling around town giving merit and blessings. Due to the great respect shown to them, their saffron robes remain perfectly dry while everything around them is drenched (and we strongly advise that you do not even think about trying to change that!). The police, by contrast, probably get more drenched than anyone else. They give as good as they get, though, and many swap their side-arms for soakers! Songkran in Pattaya is generally not actively dangerous, but there are those who do get hurt. With so much water flying around, it is only to be expected. Take particular care if you are driving a motorbike as revellers (more so the drunken ones) will have no qualms about throwing freezing water at you as you drive past. Avoid driving – take a songteaw or walk instead. Avoid wearing or carrying anything expensive, particularly if it is electrical. Not only is it likely to get soaking wet, but pickpockets are known to work the crowd. Waterproof wallets to hang around your neck are widely available. You should carry an ample supply of sunscreen with you as, with the constant soaking, it will get washed off and will need reapplying. Finally, be careful of who you target. The vast majority of people out and about during Songkran in Pattaya are up for fun and don’t mind complete strangers hosing them down. Just be mindful of giving small children and elderly people a bucket of ice water down the neck and avoid shooting people in the face. Be sure that you’re happy to take it and dish it out in equal measure, and if you are hoping to stay dry, do not leave your hotel.